The impact of both long-term and short-term climatic oscillations can be seen on the landscape. Glaciation periods lasting many thousands of years have happened repeatedly throughout the Quaternary Period. The last of these glaciation cycles ended roughly 15,000 years ago, and although glaciers did not form in the Mojave region, the overall wetter and cooler conditions that existed during glaciation periods had an impact on weathering and erosion patterns in the region. Many questions about the impact of climate change on the desert environments remain unresolved, however casual observations demonstrate that climate changes are reflected by the landscape. For instance, excavations into playas (dry lake beds) have yielded fossil remains of shelled invertebrates, fish, and plants that only could survive in perennial lake environments. Likewise, the giant sand dune fields that exist in the region today likely could not have formed when wetter conditions persisted in the region. Persistent wetter conditions cause soil to form faster and allow plants to cover what may otherwise be a barren landscape. These factors, in turn, reflect on how stream erode or deposit sediments on the landscape. The study of Quaternary lake sediments in the Mojave region has been the target of ongoing research for many decades. The climate-induced formation and disappearance of lakes in the Mojave region has also influenced the development of river drainage systems in the region over time, particularly of the Mojave, Owens, and Amargosa rivers drainages. These rivers are now mostly ephemeral in nature, but during the wettest periods of the Ice Ages they were likely sizable rivers complete with a rich fauna and flora. Below is a diagram that summarizes late Quaternary climate history based on analyses of sediments from ancient lakebeds in the Mojave Desert region. Investigations of 20th Century weather and stream flow data show the logical connection between increased precipitation and flooding, and lake development in the Mojave. According to Wells and others (1989), lake-forming climatic conditions occurred in 1916, 1938, 1969, and 1978. Wet, and possibly as important, seasonally cool conditions persisted during these years allowing shallow lakes to form in playa basins throughout the region. The regional climate during these years possibly emulates the more persistent wet and cooler climatic conditions that existed during the Ice Ages. This diagram is a compilation of wet-to-dry cycles for the late Quaternary (based on multiple sources). Note that the time scale is not clearly resolved; it is likely that older wet episodes (glacial stages 4, 8, 12, 14, and older) were as variable as the youngest period (Stage 2). Resolution of stage 2 events is possible because, not only are these sediments youngest, and therefore least disturbed and best exposed, but they are young enough to be in an acceptable range for radiocarbon dating and other geochronology methods. Information was derived from articles within Enzel, Wells, and Lancaster (2003); [Geological Society of America Special Paper 268]. 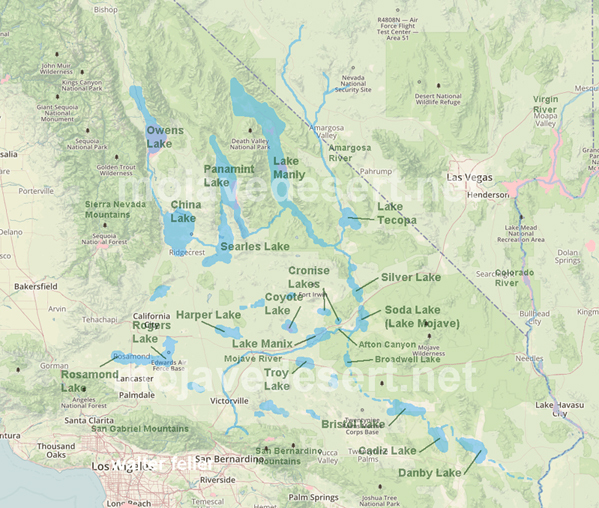 The impact of climate of the formation and disappearance of lakes in the Mojave region is relatively easy to visualize and interpret. However, climate-induced forcing impacts nearly all aspects of the biosphere and landforms in the region. For instance, wet periods not only allow lakes to form, but increased moisture over time will enhance plant growth (and range expansion), and soil development. With lakes and abundant plant cover, the sand supply to dune fields would likely be reduced. Conversely, when dry conditions return, the plant cover would eventually become reduced, and episodic desert storms would strip away soil (formed during the proceeding wet period), contributing to the influx of greater amounts of sediments downstream onto alluvial fans. Below is a generalized chart summarizing possible relationships of surface processes with climatic conditions. Generalized linkage of climate-induced forcing functions on desert processes. Ongoing research is attempting to quantify short- and long-term effects of climate change on a host of surface processes affecting biota, landslide and debris flow hazards, dust and dune field changes, water table, water supply and quality, weathering & erosion rates, stream channel processes, alluvial-fan building, and probably many other factors that may have significance to human interests.